Ventilator-associated pneumonia is the commonest, yet mostly preventable, infection in mechanically ventilated patients. Successful control of ventilator-associated pneumonia can save hospitalisation cost, and is possible by using a multidisciplinary clinical and administrative approach. The ventilator-associated pneumonia rate should be expressed as the number of ventilator-associated pneumonia days per 1000 ventilator days to take into account the device-utilisation duration for meaningful comparison. Various strategies address the issue, including general infection control measures, body positioning, intubation and mechanical ventilation, oral and gastro-intestinal tract, endotracheal tube, airway pressure, cuff pressure, selective digestive and/or oropharyngeal decontamination, and probiotic or early antibiotic treatment, as well as overall administration at a policy level. The rationale and controversy of these approaches are discussed in this article. The authors suggest that all units treating mechanically ventilated patients should have a ventilator-associated pneumonia prevention protocol in place, and ventilator-associated pneumonia should be seriously considered as a key performance indicator in local intensive care units. Unlike many other conditions for which definitive diagnoses can be made pre-mortem, the gold standard of VAP diagnosis can only be made post-mortem. Clinicians diagnose VAP by radiology, signs and symptoms, with various methods of non-invasive and invasive microbiology sampling (tracheal aspirate, directed or blind broncho-alveolar lavage, protected specimen brush for qualitative and/or quantitative culture), and histology. However, when clinical criteria with microbiology were compared with autopsy findings, both the sensitivity and specificity were approximately 70%.5 Moreover, there has been no convincing evidence that qualitative culture of non-invasive samples, when compared with quantitative culture of invasive samples, produced any significant differences in clinical outcomes.6 In a survey of 27 ICUs of nine European countries, bronchoscopy was performed only in 23.3% of episodes of nosocomial pneumonia.7 Bronchoscopy might be considered more for immunocompromised hosts, both for detection of atypical organisms (if any) and to exclude infection. The definition of VAP is therefore inherently subjective and, hence, contentious. The criteria used, interobserver variability, and subjectivity in chest X-ray interpretation affect the VAP rates by almost two-fold.8 9 All these factors influence findings in preventive trials and hamper comparisons. For surveillance purposes, most institutions use the surveillance definitions of radiology/signs/symptoms to monitor the rates. Commonly used surveillance definitions are those of the American Thoracic Society and Infectious Diseases Society of America (ATS/IDSA)10 and the CDC NHSN. The two sets of definitions are similar; the notable difference being that the ATS/IDSA guidelines exclude pneumonias occurring in the first 48 hours after intubation, whereas the CDC NHSN definition includes pneumonias in the first 48 hours; therefore, using the latter definition will result in a higher VAP incidence. In an attempt to overcome the VAP definition’s inherent subjectivity, in 2014, the CDC NHSN started surveillance using the Ventilator-Associated Event protocol,11 under which a ventilator-associated condition (VAC) is defined if there are at least 2 days of stable or decreasing ventilator settings (positive end-expiratory pressure [PEEP] and fraction of inspired oxygen) followed by consistently higher settings for at least 2 days. The sensitivity of the VAC criteria for the detection of VAP was only 25.9%.12 When further microbiological and invasive techniques are employed, a VAC can be further classified into an infection-related VAC, and possible VAP. This modification enables greater objectivity and facilitates automated electronic capture, but captures changes due not only to VAP. In terms of pathophysiology, VAP is a misnomer because its occurrence is not related to the ventilator per se, but to the presence of the endotracheal tube (ETT). The ETT allows direct access to the lower respiratory tract, impairing the cough reflex and mucociliary clearance, but provides incomplete sealing to secretions above the cuff. Microaspiration (of materials from oropharyngeal cavities, sinuses, gastro-intestinal tract) and biofilm formation are the two most important mechanisms in VAP development, while inhalation, bacteraemia and haematogenous spread play smaller roles. Molecular analysis showed that most VAP patients had the same bacteria with the same sequencing in their oral cavities as in their lungs, and there were even pathogens found in the lungs that could not be detected by conventional culture-based methods.13 Types of bacteria vary with the time of onset; in early-onset VAP, they are commonly Enterobacteriaceae, Candida albicans and Staphylococcus aureus,14 while in late-onset VAP, they are Pseudomonas aeruginosa, Klebsiella pneumoniae, and Escherichia coli. No single strategy is sufficient to prevent VAP, and several approaches are necessary. The most widely practised and well-known set of strategies is the Ventilator Bundle developed by the Institute for Healthcare Improvement (IHI) in 2001.15 The Ventilator Bundle is often mislabelled as the VAP Bundle, and its original aim was to improve better ventilator care overall, and not VAP alone, although its practice does reduce the VAP rate by 45%.15 The components of the Ventilator Bundle have now become the core of VAP prevention: (1) elevation of the head of bed to between 30° and 45°; (2) daily ‘sedative interruption’ and daily assessment of readiness to be extubated; (3) peptic ulcer disease prophylaxis; (4) deep venous thrombosis prophylaxis (unless contra-indicated); and (5) daily oral care with chlorhexidine. It is practice of the whole ‘bundle’ that decreases VAP, not just the individual components. Some components are not directly related to VAP, namely, deep venous thrombosis and peptic ulcer disease prophylaxis. Although specific data on VAP were not available, in general, the risk of hospital-acquired pneumonia increased when acid-suppressant medications were used. There was a slight trend for reduced VAP with sucralfate compared with a histamine 2 receptor antagonist, and proton pump inhibitors may be related to a higher rate of VAP.16 Therefore, acid-suppressant medications should not be overused. 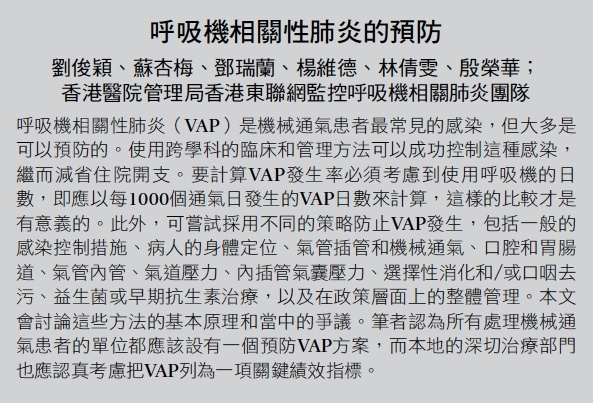 In Hong Kong, the Centre for Health Protection of the Department of Health promulgated a set of recommendations of VAP prevention in 2010.17 In this article, we review the latest literature regarding VAP prevention, and the strategies are summarised in the Table. The rationale and controversy are elaborated in the following discussion. General principles of infection control should be followed. Ventilator tubing should not be changed more frequently than every 1 week unless it is visibly soiled. In an early prospective randomised trial of 447 patients, decreasing the frequency of ventilator circuit changes from 3 times to once per week had no adverse effect on the overall rate of VAP.18 Subsequent trials also showed that circuit change intervals of 7 and 30 days had even lower risks for VAP than 2-day intervals.19 There was evidence that chlorhexidine bathing and hand hygiene compliance reduced global and specific infection rates, including VAP.20 A protocol for microbiological surveillance could be considered to aid in selection of empirical therapy. In a RCT of 128 adult mechanically ventilated patients, daily interruption of sedation resulted in a highly significant reduction in time spent on mechanical ventilation.25 The same authors also showed in the Awakening and Breathing Controlled trial that paired daily spontaneous awakening tests (ie interruption of sedatives) with daily spontaneous breathing tests resulted in better outcomes for mechanically ventilated patients.26 Although there is persistent concern of increased complications with this practice such as self-extubation, subsequent study found that this was not the case. A nurse-implemented sedation protocol has been shown to decrease VAP.27 Our ICU is also performing a nurse-led early weaning trial to aim at shortening the intubation period. Using chlorhexidine mouth rinse or gel as part of oral hygiene care, compared with placebo or usual care, was associated with a reduction in VAP, with a number needed to treat of 15 (95% confidence interval, 10-34).28 There is no consensus for the best practice for oral hygiene care. The optimal concentration of chlorhexidine solution to use is not known. Chlorhexidine has been studied in two strengths: 0.12% and 0.2%, and the US Food and Drug Administration recommends 0.12% oral chlorhexidine for use as mouth rinse. There is no evidence that the following is necessarily better than using chlorhexidine alone: addition of manual or powered tooth brushing, using Listerine (Johnson & Johnson Healthcare Products, New Brunswick [NJ], US), sodium bicarbonate oral rinses, or use of povidone-iodine solution. Povidone-iodine seemed to increase the rate of acute respiratory distress syndrome.29 A local study showed that continuous clearance of oral secretion by the saliva ejector might reduce the rate of VAP, decreasing the duration of mechanical ventilation, and shortening the duration of stay of patients in the ICU.30 Although gastroesophageal aspiration is implicated in VAP development, in an intention-to-treat study of 449 patients on mechanical ventilation, the absence of gastric volume monitoring was not inferior to routine residual gastric volume monitoring in terms of development of VAP (16.7% in the intervention group and 15.8% in the control group), nor were there any significant between-group differences in other ICU-acquired infections, mechanical ventilation duration, ICU stay duration, or mortality.31 There were more VAPs with early enteral feeding, and less with post-pyloric feeding. Further studies are required to confirm this. Novel designs of ETTs target two major mechanisms of VAP, namely, microaspiration and biofilm formation.32 33 Microaspiration is controlled by incorporating changes in cuff shape, material, and addition of a subglottic suction port. Prevention of biofilm formation is managed by addition of coating, surface modification, and removal of biofilm by mechanical means. The conventional ETT cuff (eg Portex; Smiths Medical International Ltd, Ashford, UK) is made of polyvinyl chloride (PVC), of which, when inflated, redundant parts fold on themselves and, because of the thickness of the material (>50 µ), microchannels form through which leakage is possible. By modification of the shape from conical to tapered (eg TaperGuard; Covidien, Irvine [CA], US), better contact of the cuff with the trachea can be achieved, and microchannel formation is reduced. By modification of the material from PVC to the thin 7-µ thick polyurethane (eg Microcuff; Kimberly-Clark Health Care, Roswell [GA], US), microchannel formation can almost be prevented. Our benchtop study showed that the Microcuff consistently outperformed the Portex and the TaperGuard in terms of leakage, especially during zero PEEP mechanical ventilation, laboured breathing, disconnection, and airway suction.34 One disadvantage of the Microcuff is that the material is so thin that even moisture diffuses across, leading to fluid accumulation inside the cuff with resultant blockage of the pilot balloon tube. This can be solved by purging the tube with small amount of air. Other materials being studied are Lycra fibre (Invista, Wichita [KS], US), silicone, and latex. Addition of a subglottic suction drainage (SSD) port removes secretions collected above the cuff (eg TaperGuard Evac, Covidien). In a meta-analysis of 10 RCTs with 2213 patients, SSD significantly reduced the incidence of VAP and early-onset VAP, shortened ventilation duration by 1.55 days, and prolonged time to VAP by 3.90 days.35 Ports of SSD are now available in tracheostomy tubes. One study of such tracheostomy tubes showed that the prevalences of VAP were 56% in the control group and 11% in the suction tracheostomy group.36 The SSD port can be put into intermittent or continuous suction, with similar efficacy of VAP prevention. However, the port could become blocked secondary to suctioned tracheal mucosa in one third of cases, with the possibility of tracheal injury. Maintenance of a positive pressure gradient across the ETT cuff is an important factor to prevent secretions collecting above the cuff to trickle down across the cuff-trachea interface due to gravity. This pressure gradient is positive during positive pressure ventilation, but becomes zero during airway disconnection, and periodically negative during laboured inspiration through a narrow ETT or during airway suction. Without positive pressure, leakage around the cuff is significant, especially if the conventional PVC cuff is used and the cuff pressure is less than 30 cm H2O.34 During routine care, disconnections of the airway circuit are frequent, for instance, use of another ventilator for patient transport, change of the heat-and-moisture exchanger, spontaneous breathing trials, and change of ventilator tubing. Such disconnections should be avoided as far as possible. Spontaneous breathing trials should not be unduly prolonged without the intention for resumption of positive pressure ventilation or direct extubation. There is no evidence that the two methods of humidification, namely, using either a heated humidifier or a heat-and-moisture exchanger, affect the VAP rate. Most meta-analyses have shown reductions in VAP with the use of selective digestive decontamination or selective oropharyngeal decontamination, but these interventions are still not being widely implemented because of concerns of emergence of antimicrobial resistance in pathogens. A recent systematic review of 64 studies suggested that such perceived risk of long-term harm could not be justified by the available data, but admitted that the effect on ICU-level antimicrobial resistance rates was understudied.41 Further studies are also required for the use of probiotics regarding efficacy and the risk of colonisation or infection with probiotics. Around 10% to 30% of ventilator-associated tracheobronchitis may progress to VAP, and appropriate antibiotic treatment was independently associated with reduced risk for transition.42 For antibiotic prophylaxis, a prospective cohort study of 129 comatose patients (Glasgow Coma Score ≤8) showed that a single dose of antibiotic within 4 hours of intubation might lower the incidence of early-onset VAP, with no difference in late-onset VAP.43 Further RCTs are needed. Good administrative strategies and coordination are especially important for the implementation of this bundle of strategies all the way from patient care, equipment, infection control, and antibiotic stewardship. Considering the situation in Hong Kong that mechanically ventilated patients are being looked after not only in the ICU, but also in various critical care areas such as high dependency units, respiratory wards, and even general wards, it is imperative that a VAP protocol is in place and diligently adhered to in every such unit, with regular audits to ensure compliance. The existence of written standards for management of mechanically ventilated patients and the availability of VAP surveillance systems were positively associated with compliance with VAP-prevention measures and should be fostered at a policy level.45 Cost-effectiveness data for the whole Ventilator Bundle are scarce and such analysis should be performed in future research. In one Danish cost-effectiveness analysis, implementation of the Ventilator Bundle was found to be potentially cost-effective from the perspective of the hospital, using outcomes of prevention of VAP and prevention of death.46 In view of the necessity for multidisciplinary involvement, VAP surveillance is better coordinated at a higher administrative level. The Hong Kong East Cluster of Hospitals has established a Task Force on Prevention of VAP in Critical Care Areas since 2013. Ventilator-associated pneumonia should also be seriously considered as a key performance indicator in Hong Kong ICUs, as in other advanced countries. Ventilator-associated pneumonia is the commonest, yet mostly preventable, cause of morbidity and mortality in mechanically ventilated patients. Successful control of VAP can save total hospitalisation cost, and is possible by using a multidisciplinary clinical and administrative approach. All units taking care of mechanically ventilated patients should have a VAP-prevention protocol in place, and VAP should be seriously considered to become a key performance indicator in local ICUs. 3. Ventilator-associated pneumonia (VAP). Available from: http://www.cdc.gov/hai/vap/vap.html. Accessed 21 Jul 2014. 6. Berton DC, Kalil AC, Teixeira PJ. Quantitative versus qualitative cultures of respiratory secretions for clinical outcomes in patients with ventilator-associated pneumonia. Cochrane Database Syst Rev 2012;(10):CD006482. 8. Novosel TJ, Hodge LA, Weireter LJ, et al. Ventilator-associated pneumonia: depends on your definition. Am Surg 2012;78:851-4. 11. Ventilator-Associated Event (VAE). Available from: http://www.cdc.gov/nhsn/PDFs/pscManual/10-VAE_FINAL.pdf. Accessed 1 Jan 2015. 15. How-to guide: Prevent ventilator-associated pneumonia. Available from: http://www.ihi.org/resources/Pages/Tools/HowtoGuidePreventVAP.aspx. Accessed 20 Jul 2014. 17. 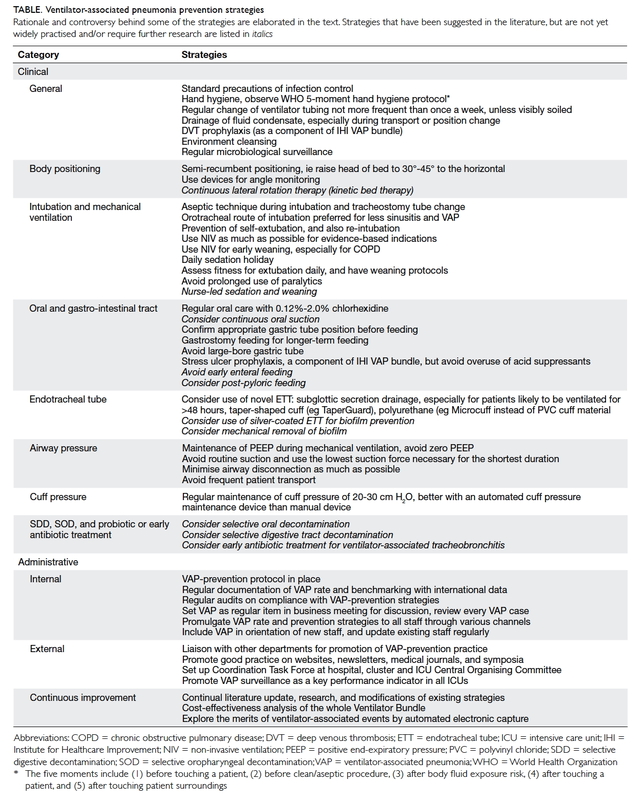 Recommendations on prevention of ventilator-associated pneumonia. Scientific Committee on Infection Control, and Infection Control Branch, Centre for Health Protection, Department of Health; 2010. 22. The Gravity VAP network. Gravity VAP-Trial. Available from: http://compartint.net/gravityvaptrial/joomla/. Accessed 21 Jul 2014. 24. Burns KE, Meade MO, Premji A, Adhikari NK. Noninvasive positive-pressure ventilation as a weaning strategy for intubated adults with respiratory failure. Cochrane Database Syst Rev 2013;(12):CD004127. 28. Shi Z, Xie H, Wang P, et al. Oral hygiene care for critically ill patients to prevent ventilator-associated pneumonia. Cochrane Database Syst Rev 2013;(8):CD008367. 33. Lam SM, Lau AC. 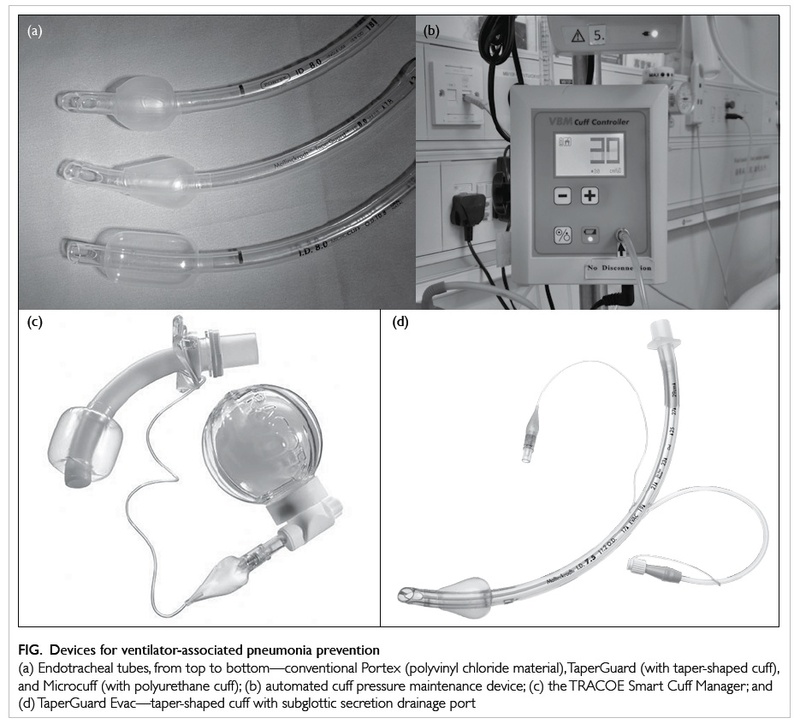 Prevention of ventilator-associated pneumonia (VAP) by novel endotracheal tube designs. Hong Kong Lung Foundation, Hong Kong Thoracic Society & ACCP (HK & Macau Chapter) Newsletter 2011: 32-5. 35. Wang F, Bo L, Tang L, et al. Subglottic secretion drainage for preventing ventilator-associated pneumonia: an updated meta-analysis of randomized controlled trials. J Trauma Acute Care Surg 2012;72:1276-85.